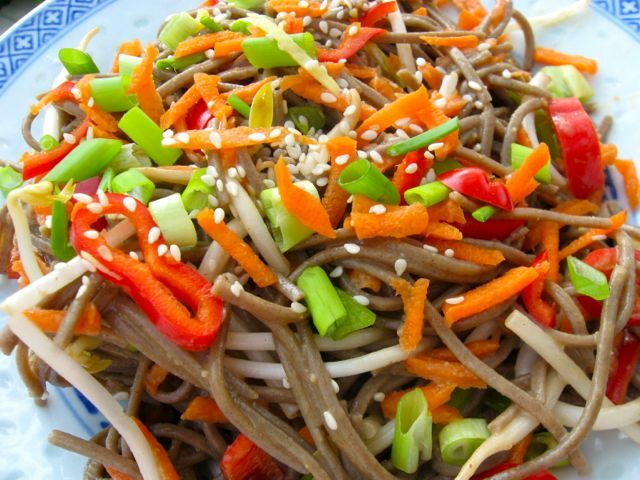 Shirataki are low-calorie, gluten-free noodles made from sweet potato, with an interesting chew. They require no cooking, come packed in water, and can have an off-putting smell when you open the bag. Don’t be afraid; just rinse them well. Find shirataki, along with rice vinegar and sesame oil, at most Asian markets and natural-food stores. In a large skillet, heat the oil over medium-high heat. Add the garlic, ginger, and scallions. Cook, stirring occasionally, until the vegetables are fragrant and softened, about 2 minutes. Add the carrot, celery, and red bell pepper. Cooking, stirring occasionally, until they become tender, 2 to 3 minutes more. Add the cabbage and tofu. Cook, stirring occasionally to prevent the vegetables and tofu from sticking to the bottom of the pan. Cabbage wilts quickly, so this will take only 3 to 5 minutes. In a small bowl, whisk together the soy sauce, rice vinegar, agave nectar, and sesame oil. Pour the mixture over the vegetables and tofu, and stir gently until evenly coated. Add the shirataki and toss to combine. Cook, giving a gentle stir, until the sauce is mostly absorbed and the shirataki is heated through, a few minutes more.